Luxury modern apartment,only one rented in villa,private swimming pool,big terrace,privacy,green nature,partly sea view,summer kitchen,free parking,internet∫.ch tv,beach neaby,close to any spot. This pretty holiday apartment with a swimming pool is located on a hill, from where there is an unforgettable panoramic view on the town of Split and middle Dalmatia. 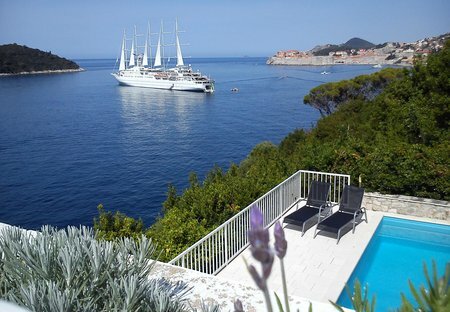 Relax by the private heated pool with sea view and unwind on a sun lounger of our charming home located near Dubrovnik. Enjoy the beautiful patio with outdoor Jacuzzi and rustic Mediterranean charm. This beautiful apartment with pool is furnished with attention to detail and located in the picturesque village of Gromaca, outside of the historical city of Dubrovnik. This holiday home with pool is located in the village of Tugare, in the hinterland of Dalmatia. It consists of two floors connected by internal stairs. This pretty holiday villa with swimming pool is situated on a hilly terrain in the small place Kucine, from where there is a panoramic view on the sea, the islands and the city of Split. This magnificent property is a hidden piece of paradise and extends to 4000sqm of fenced land. The holiday villa with pool is located on a hill overlooking the Cetina River and the entire region. This wonderful and spacious villa, which is in close proximity to a beautiful pebble beach, ensures complete privacy. Due to its breath-taking location. This house is located next to the sea and pebble beach in a small and quiet place, near the Center Healthy Living Seget. After walking ca. This 7 bedroom villa with private pool is located in Sveta Nedjelja and sleeps 14 people. It has WiFi, a garden and barbeque facilities. Two stone houses with swimming pool and great sea view in very calm part of Brela near Split and Makarska. We rent it as one complex for max 10 people. This comfortable holiday home is provided for 25 persons and beside a swimming-pool and fitness room it has entertainment possibilities like darts. This pretty and luxurious holiday home is situated on a property of more than 20000 m2 and has a large swimming pool. At the upper side of the house, there is a small vineyard.